Use a straining bag to line the cage of the fruit press before emptying the pumice in. Helps by straining the pips' and other debris from the juice. 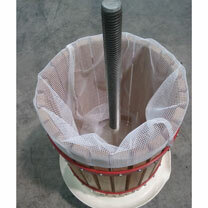 Available in 3 sizes: Press bag for use with 6 litre fruit press 30 x 40cm. Press bag for use with 12 litre fruit press 40 x 42cm. Press bag for use with 18 litre fruit press 56 x 44cm.